A couple’s retirement checklist is an essential part of retirement planning. Retirement is a major life transition, which will have a significant impact on your relationships. A study of 648 married couples, ages 46-75, by Fidelity Investments (May2011), highlighted some of the retirement related differences couples need to resolve. More than three in five couples differ on their expected retirement ages. Almost one half of couples surveyed don't agree whether they'll work in retirement. More than half of couples surveyed say one of the best pieces of advice they would give to newlyweds is to make all financial decisions together. One-third of couples surveyed don't agree on lifestyle expectations in retirement. To resolve conflicting expectations and opinions about retirement, couples should answer the following questions separately. They can then compare the results and agree on which areas require further discussion and compromise? What is your vision of an ideal retirement lifestyle-leisure filled, or active? If one partner wants to see the world, and the other prefers to stay at home gardening, negotiation and compromise is necessary. Have you individual and joint goals for retirement? What do you plan to do differently in retirement? Have you pre-tested your retirement plans, e.g. Hire and tour in an RV, before purchasing and committing to an RV lifestyle? Have you shared your non financial retirement planning with your spouse or partner? 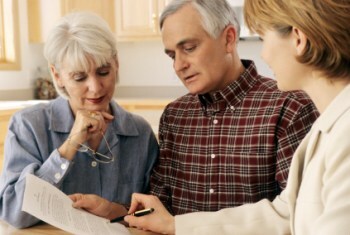 Are you both involved in retirement financial planning? Have you estimated how much income you would require to support your retirement lifestyle? Do you know where important documents regarding savings and investments are kept? Could one of you take over, if needed? Have you an agreed timetable for retirement? Are you both retiring at the same time? Do either of you plan to continue working part time? How will you replace your work role with an alternative source of meaning and fulfilment? Are you ending a career with unfulfilled ambitions, as you contemplate the gap between your dreams as a young person, and what you've actually achieved? Do you look forward to holiday breaks together, engaging in social activities, exercising together, walking, jogging, and swimming or gym activities? Will you each keep in contact and make time for relationships with friends, as well as keeping up with personal hobbies and pastimes? Retirement will give you the possibility of joining an active retirement community, with time for involvement in local or other activities. How do your respective personalities respond to this opportunity? Are you aware that the secure social contacts facilitated by work may not be easily replaced by individuals with a reserved personality? Are you in agreement on the degree of obligations and responsibilities to your adult children and family? Have you discussed how your roles may change regarding household tasks post retirement? Prior to retirement one partner may have assumed more responsibility for - gardening, cooking, washing up, laundry, paying the bills, and general maintenance. Have you considered the need for personal space within the home, a place where you can be alone to concentrate or relax? Have you a plan for sharing household responsibilities in a different way? New house rules should be by agreement and should never give rise to critical comparisons. Where do you plan to live in retirement? Will you stay put, move to a different part of the country, or retire abroad? Have you a plan to maintain your health and wellbeing, whilst acknowledging that at some stage you are likely to encounter health problems? Do you understand that occasional depressive feelings, and health concerns, are a normal occurrence in this life stage? Have you considered seeking the assistance of a retirement coach in discussing the above issues? Are you open to participating in that process with your partner? Have you a couple's retirement story you would like to share with us?